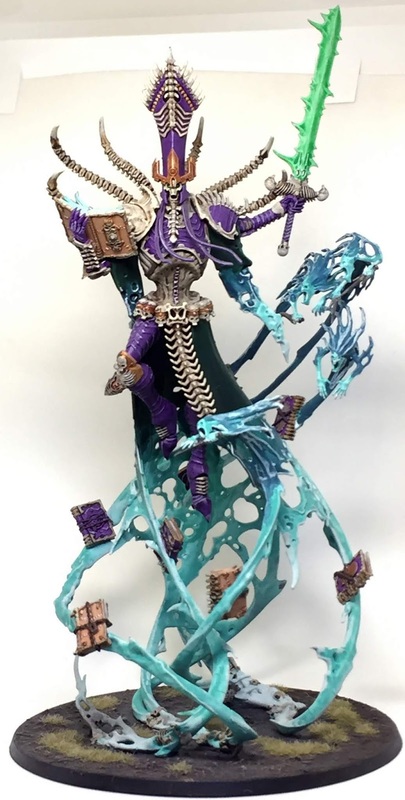 The new Adepta Sororitas list in Chapter Approved 2018 has me really excited about my favorite army. In the absence of any new models I have decided to strip and repaint most of my infantry. 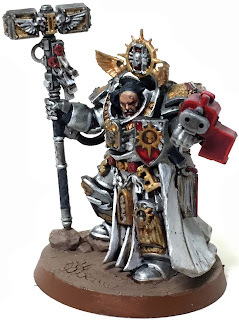 Over the last three days or so I painted Taddeus the Purifier from Blackstone Fortress. Sisters of Battle new army list review. 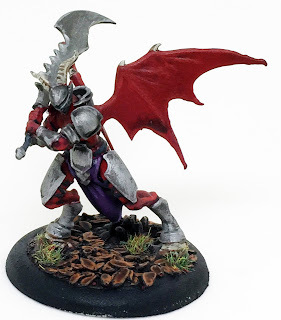 I don’t often do tactical reviews on here – I’m mostly about painting cool models. 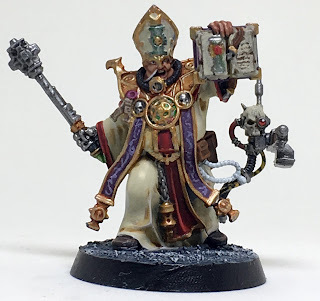 However I do love the Sisters of Battle, and so here are my initial thoughts on the Beta codex. 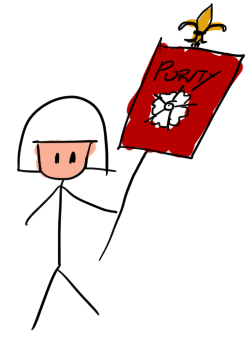 Unless you play a lot of 40k, the rest of this post is going to be fairly incomprehensible. I managed to get a second commander painted before the painting thingy is judged. Somehow she looks much better in person then in the photograph. I think next year I am going to try and work on my photography a bit more. Although that risks becoming an expensive sub-hobby to an already expensive hobby. I am also going to try and paint 500 models next year. And count them down on this blog. 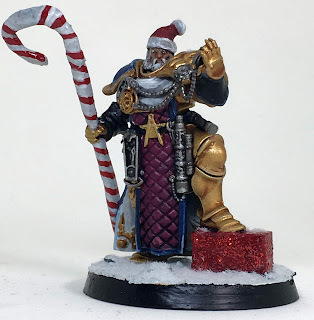 It's nearly Christmas and stuff, which means my local Games Workshop was running it's Christmas themed conversion / painting competition. In previous years I have resisted but this year I was egged on by a colleague. 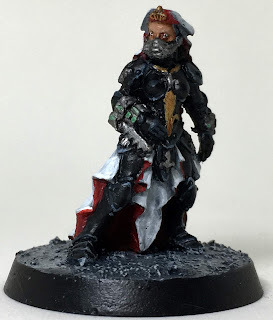 More Dark eldar kill team, and a bit of a ramble. Hello! I'm not dead. Still painting. I painted five more dark eldar for my Kill Team Roster. 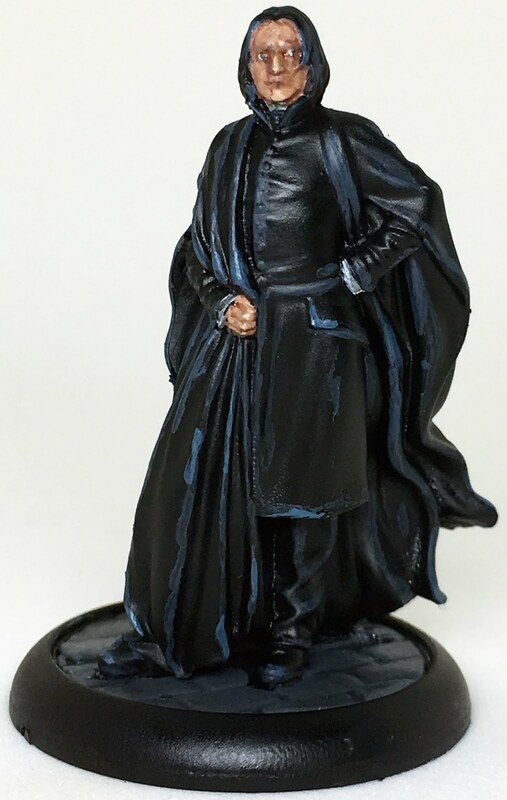 So, my wife is a massive fan of the Harry Potter franchise. It's a weird thing. She's only one school year younger than me but Harry Potter passed me by completely until the films came out. Seminal book series that informed my growing up were Hitchhiker's guide to the galaxy and Lord of the rings. And yet, as films, I think the Harry potter films are in many way better than the film versions of LotR. Although I do struggle with the manifest lack of world building. Inasmuch as the wizarding world is superficially part of the real world now. Which just doesn't really work. There are all these wizards around doing quite visible stuff and the military never takes an interest? 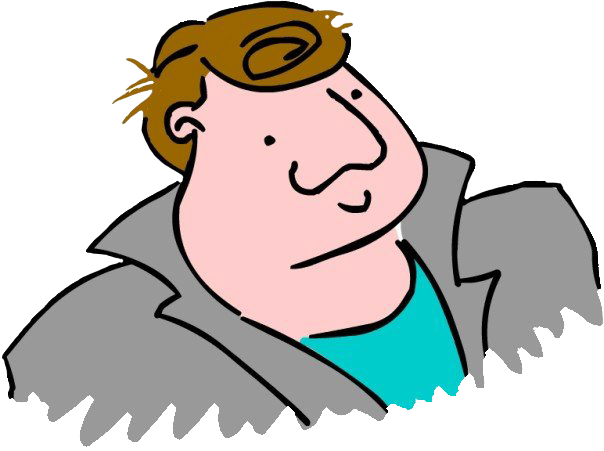 MI5 doesn't notice all the people flushing themselves down toilets in central London and take a vague interest? No wizard ever thinks well, these death eaters have powerful magical abilities, but there anathema to muggle tech means they won't see my M134 Minigun coming? These are nerdish hangups for nerds, but I think if you do the 'my setting is a hidden part of the real world' you have to address what happens when the real world and the fictional world come into some sort of conflict. Even if it is just to point out that your monsters are immune to bullets. A little while ago now my wife and I finished painting the terrain for our kill team table. This was a really interesting project and I want to show off a few pictures and also talk a little bit about the philosophy in play here. I decided to make a second kill team, this time Dark Eldar. 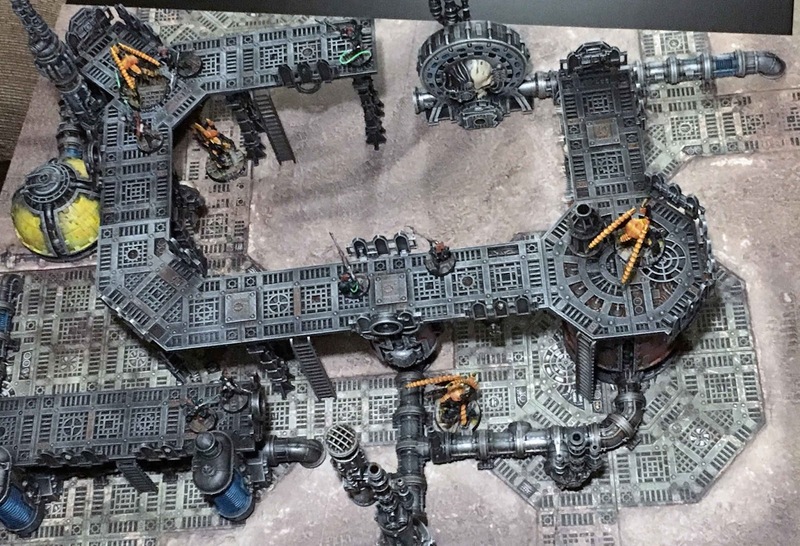 Partly I was frustrated by the Tau's total inability to kill things in close combat which is a requirement of one of the four core matched play missions for kill team. However mostly I was inspired by the addition of Dark Eldar to the Inquisitor: Martyr video game. 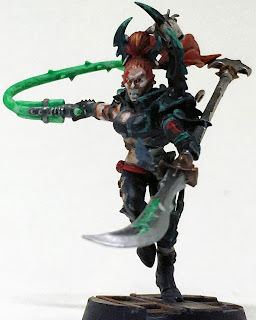 (If you want my 5 second review of that game: It's a beautiful narrative experience for fans of Warhammer 40,000 with excellent art assets and voice acting, which is let down by repetitive game play) I decided to paint them in the very traditional Dark Eldar black-green with red accents. Also they are all girls without helmets, because it just so happens that in a Wyches box you can build six girls (out of then) and in a warrior box you can build four girls (out of ten). I actually finished these a little while ago, as any of you who follow my instagram will know but I had to finish my dissertation, and deal with a small mountain of new school year work agro, and my back is playing up and some other annoying personal stuff. However I have finally carved out some time now so enjoy. Painted Alt Barbaros. A fairly basic paint job. I like the way the metal came out though. Made the choice not to put any rust or grime on it because I think Malifaux lends itself to a slightly more comic book appearance. I've said this before but Malifaux models are always such a quick paint job compared to Games Workshop stuff because there is less detail crowding out every surface. I am super hyped for the release of Warhammer 40,000 Kill team this Saturday. 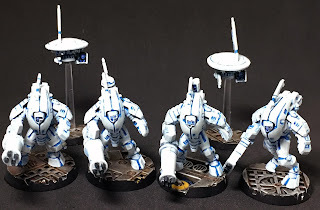 So much so that I managed to put together enough in the way of rules from blurry photographs and youtube videos to put together a Tau Kill team. Why stop at painting one large centerpiece unit when you have the Supreme Lord of all the undead sitting in your painting pile. Another miniature just crying out for the new technical paints. Now that the new technical paints have come out, I can progress through my backlog of things with spirits and such on which were vaguely on hold since the two new paints I talked about in my last update were announced. 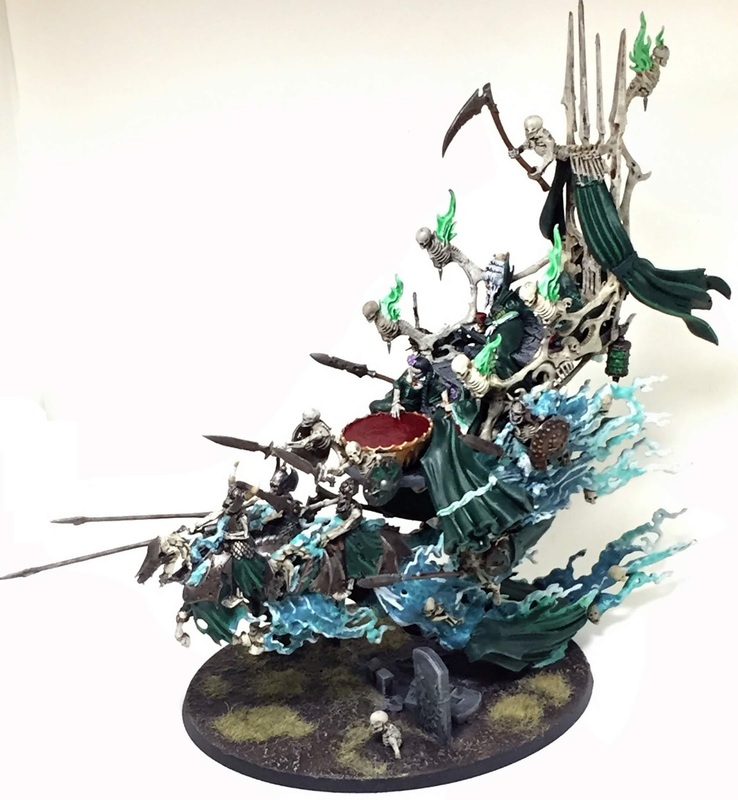 First up is the coven throne. So as you probably know the new edition of Age of Sigmar launched this weekend. I had the good fortune to be up at Games Workshop HQ for the Age of Sigmar open day. One product that may have been overlooked is the two new technical paints. 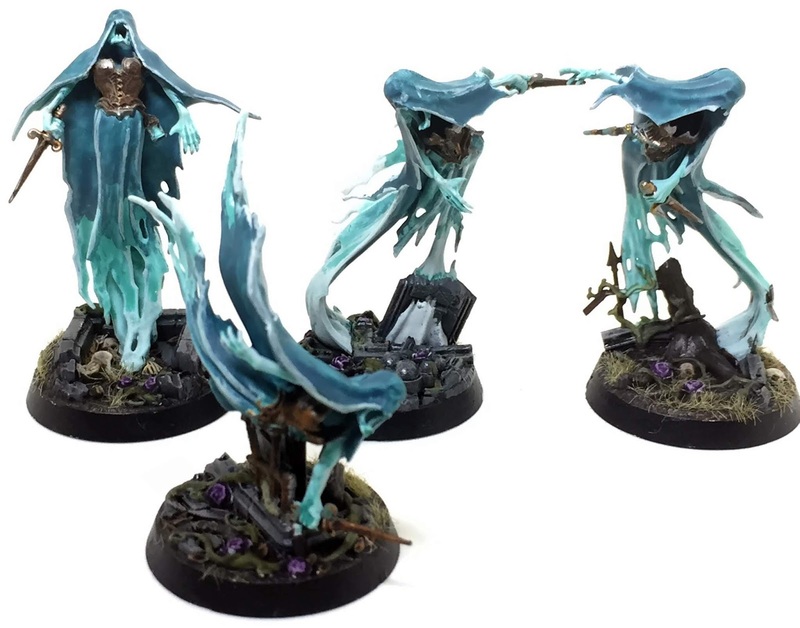 Nighthaunt Gloom and Hexwraith Flame. 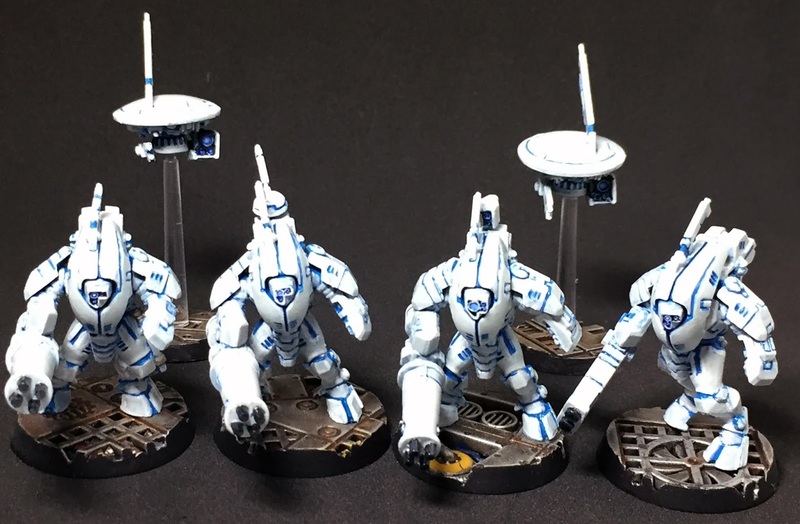 The following is my attempt at a review of those paints. So with the new Imperial Knight stuff I realised that I could fit one of the new Armigers into a 2000 point list. 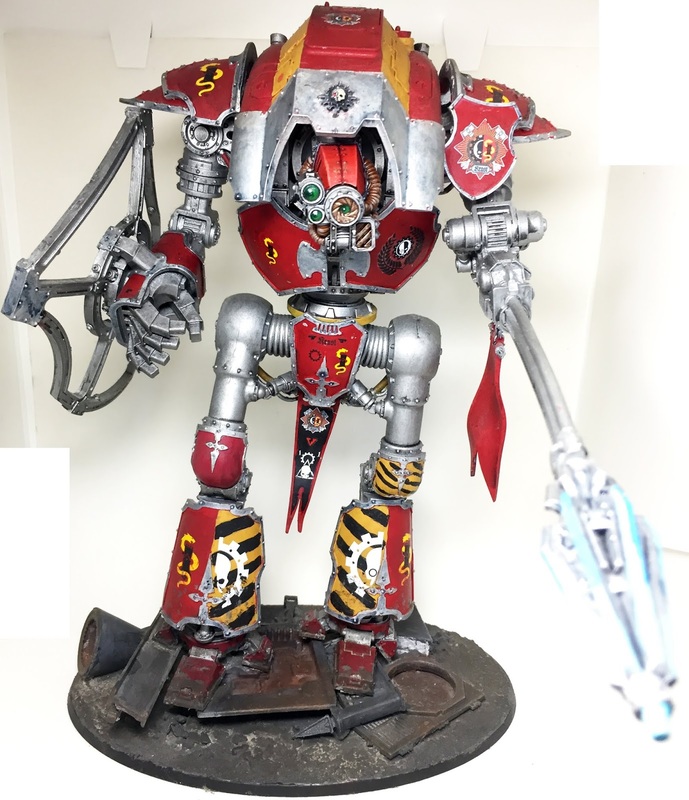 I painted one up recently (he is down the bottom) but I also decided to photograph and upload my other four older knights. I should point out that the alternate head on the lancer here is also a recent paint job, which is why it looks so much better then the rest of the knight. I don't really like Orks. Orcs. Orruks. Green bald barbarian men. However, I had these guys knocking around due to wanting the shadespire cards, and I wanted something different to paint to refresh the creative particles. I decided to paint them in a slightly more realistic style rather then the comic book yellow style that Games Workshop use for their own Ironjaw's. I think it looks quite good, although I suppose the weapons do blend into the armour. I could have used some random black or gold or bronze or something to break it up, but there is always that tension between what colours would look good, and what colours things feel like they "should" be. This time common sense won out. Grey Knights... and another knight. Tw updates a week in the small hours of the morning? Can you tell it's the half term holiday? I decided I wanted to paint more stuff and I had these guys sitting around on my half done projects shelf. So a little while back I decided to only collect imperial armies in 40k to try and cut down on the number of little painted figures I have to share my appallingly tiny flat with. (that's not working out so well). 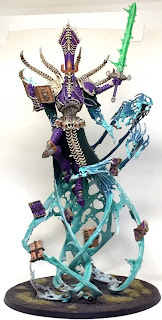 One of the side effects of this was that I needed to replace the small army I use in my school Warhammer club when we get an odd number of students. I have always had a kinda-sorta relationship with Grey Knights. I always thought they were really cool in small numbers but was a little leery of giant armies of them. So a small 35 power army of them seems like a cool way to scratch that itch. 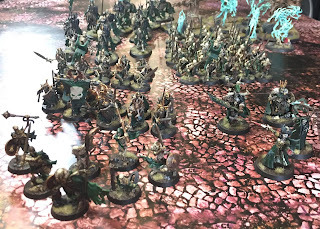 As those (all three of you) who follow my instagram will know, I have been painting a horde of skeletons to channel the nervous energy generated at work into something useful. I completed this mammoth unit of 40 over the bank holiday weekend and decided now would be a good time to take a look at the skeletal horde I have assembled so far. 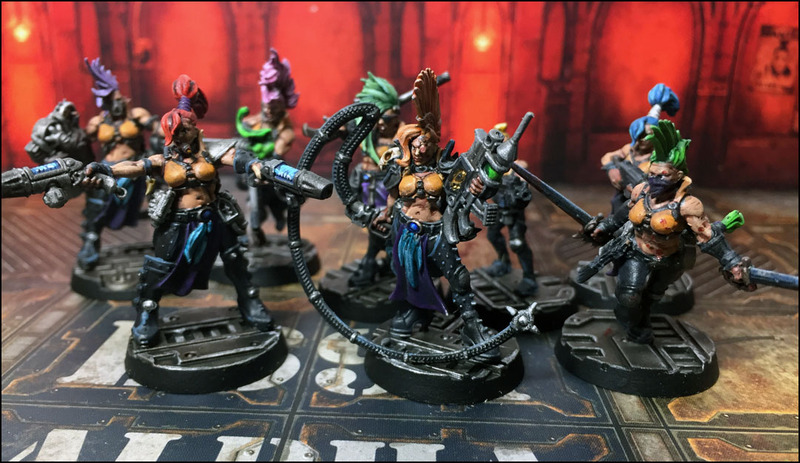 Well, I finally got around to doing some more painting, this time of my starting house Escher gang for the new edition of Necromunda. These miniatures were a real joy to build and paint, and I'm really very pleased with how they turned out. I have also tried to up my photography game a little bit so I hope you enjoy.